Pitched on a high ground overlooking the town junction, the Dzong was first constructed in 1549 by the great grandfather of the first Shabdrung. Welcome to Bhutan, the Land of the Thunder Dragon. Touching down at Paro International Airport, you will be greeted by your guide upon exiting the arrival hall. Today, we will take it easy to acclimatise to the altitude. 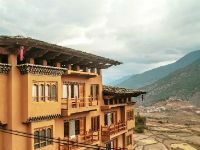 Drive to Thimphu, check in to the hotel and let’s have your first taste of Bhutanese cuisine and some light sightseeing in Thimphu if possible. Dochula Pass - The 108 chortens was built by the present Queen Mother of Bhutan Ashi Dorji Wangmo Wangchuck to commemorate Bhutan’s victory over Indian militants and to liberate of the souls lost. Punakha Dzong - Built in 1637, the dzong continues to be the winter home for the clergy, headed by the Chief Abbott, the Je Khenpo. It is a stunning example of Bhutanese architecture, sitting at the fork of two rivers, portraying the image of a medieval city from a distance. 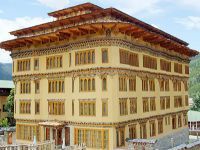 The dzong was destroyed by fire and glacial floods over the years but has been carefully restored and is, today, a fine example of Bhutanese craftsmanship. We will start our 7 hour drive to Central Bhutan. Before we start we will pay a visit to Chhimi Lhakhang (left) - A 20 minutes walk across terraced fields through the village of Sopsokha from the roadside to the small temple located on a hillock in the centre of the valley below Metshina. Ngawang Chogyel built the temple in 15th century after the ’Divine Madman’ Drukpa Kuenlay built a small chorten there. It is a pilgrim site for barren women. This is one of the most spectacular valleys in Bhutan and also the heartland of Buddhism in Bhutan. It is an area with a wide variety of fauna and flora. 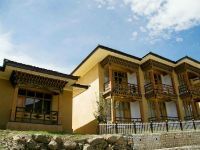 The Guru Rinpoche and his lineage of Tertons (treasure finders) making Bumthang his home have led to more than 40 temples being built in this peaceful valley. Witness the tsechu today, a rich form of the oral history tradition where the Bhutanese pass on values, mythology and spiritual beliefs through the dance dramas. The Prakhar Tshechu will culminate with a rare display of a giant silk applique thangkha (painting) depicting Guru Padmasambava or some other important Buddhist deity this morning. On route to Gangtey is Trongsa, the ancestral home of the ruling dynasty. Trongsa, literally "New Town" in the Dzongkha language, is where the current monarchy had its origin in Bhutan. Each King in the line of succession has held the post of Trongsa Penlop or Governor before donning the Raven Crown. Trongsa DzongThe foundations of Trongsa Dzong were laid in the 16th century by. 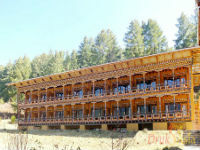 Its foundation was laid by Pema Lingpa and flourished during the 17th century under Shabdrung Ngwang Namgyal. The impressive fortress is a massive structure, its wall looming high above the winding Mangde Chu Valley,commanding the east-west road. The Trongsa Museum (Ta Dzong), sits high above the valley at a strategic vantage point over Trongsa Dzong. The "Tower of Trongsa" tells the stories of the dzong and the valley that it has watched over for centuries. His Majesty the King inaugurates the Ta Dzong as a museum dedicated to the Wangchuk dynasty, land marking yet another significant event as the nation celebrates 100 years of the monarchy. It has been restored into a classy museum that represents a tasteful blend of tradition and modernity. There are 224 items on display, include a sacred image of Sung Joenma Dorji Chang (self spoken Vajradharna), a bronze statue of Pema Lingpa, made by himself and a number of centuries old treasures like dance and ritual costumes and objects, ancient prayer books, paintings and scrolls and textiles. The valley of Phobjikha is well known as the winter home of the Black necked crane (Grus Nigricollis). Bhutan is home to around six hundred black-necked cranes with Phobjikha being one of the popular places that the birds migrate to in the winter months from the Tibetan plateau. The elegant and shy birds can be observed from early November to end of March. This is an old monastery that dates back to 17th century. Nature Hike along the valley of Phobjikha - A short trek of about 90 minutes known as the 'Gangte Nature Trail' starts from the Mani stone wall to the north of the Gangteng Gonpa and ends in Khewa Lhakhang. 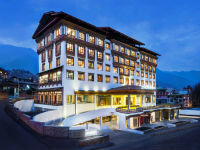 Thimphu, the modern capital of Bhutan. Made up of just three main streets, it is only one of 2 capitals in the world without traffic lights. 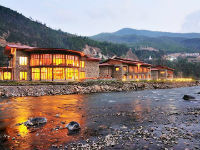 As the capital of Bhutan, Thimphu offers a rich cultural heritage with places of interest as listed below. 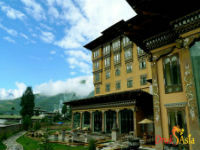 In the morning, we will head to Thimphu, driving pass Wangdue and Dochula Pass again. 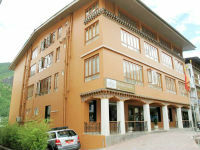 Once we reach Thimphu, perhaps its time for you to take a short break. Seat yourself at one of the numerous cafe in town and write postcards for your family and friends. 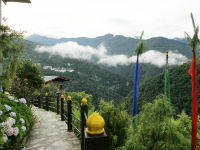 Or head to a view point to visit the Takin Enclosure or view Thimphu from afar. Heritage Museum - Dedicated to connecting people to the Bhutanese rural past though exhibition of artefacts used in rural households. Textile Museum - Witnesses the art of traditional weaving. Takin enclosure - On the way to the viewpoint over Thimphu is the home of Bhutan’s national animal, the Takin; a strange looking beast some say looks like a bee stung moose. Centenary Farmers’ Market - Every Saturday and Sunday most of the Thimphu population congregate on the banks of the river where the weekend market is held. Here villagers from the valley and other nearby places come to sell their agriculture products. Paro Valley - The beautiful valley is home to many of Bhutan’s old monasteries and temples. The country’s only Airport is in Paro. The valley is also home to mount Chomolhari (7,300 meters) situated at the northern end of the valley whose glacier water forms the Pachu flowing through the valley. 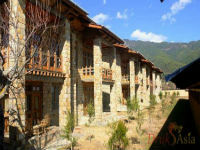 The following are some of the prominent places to visit in Paro. Paro Dzong - also known as Rinpung Dzong, this 15th century massive fortress/monastery, is also the administrative centre of the dzonkhag. Ta Dzong - Built as a watch tower the Ta Dzong, it was converted into the National Museum in 1968. 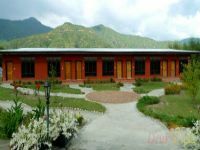 The museum boasts antique Thangka, textiles, weapons and armour, household objects and rich assortment of natural and historic artefacts. 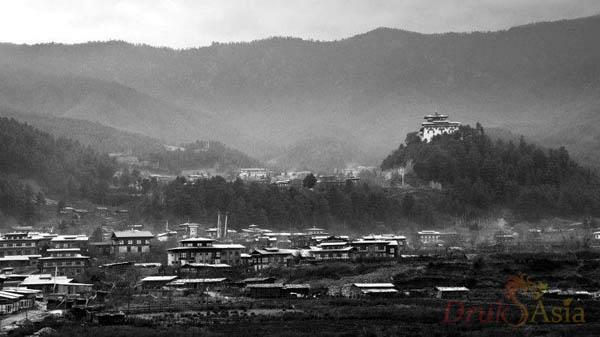 A morning drive, north of Paro valley brings us to the ruins of Drukgyal Dzong. Built in 1647 by the great Shabdrung Ngawang Namgyal, father and unifier of medieval Bhutan, the Dzong was destroyed by an accidental fire and left in ruins as an evocative reminder of the great victories it was built to commemorate. Explore the ramparts and relive the memories of a glorious past. Beyond Satsam Chorten, we hike up to the Taktsang Monastery (Tiger’s nest). The 1.5 hour hike to the cafeteria is also a vantage view whereby you can enjoy the stunning view of the monastery. Prayer flags adorn the cliffs and this is also where Guru Padmasambhava landed on the back of a tigress in the 8th century. 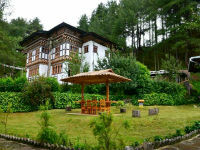 After a sumptuous local lunch, we will retrace our steps to visit Kyichu Lhakhang, one of the oldest temples in Bhutan. Please refer to the photos as attached. The trip has been awesome and Bhutan will definitely be one unforgettable destination. With the many breathtaking sights and the warm hospitality from the good Bhutanese people, Bhutan is a place that leaves me with good memories. Not forgetting our guide, Ugeen, who is knowledgeable and always so friendly and helpful, and our driver, Bola, who is all humorous and caring. We thoroughly enjoyed ourselves and was indeed a memorable trip. 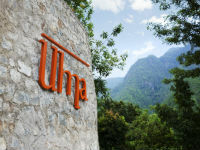 I'm still in the midst of organising my photos and I did take some photos of our home stay for you. Will be happy to share our photos. Cecilia's 60th birthday was also a very memorable one for her. Thanks to you for helping us put through the special surprise request and KP arranged for a birthday cake. It was also a particularly meaningful birthday for her as she also had the opportunity to make offerings to Guru Rinpoche that day which was an auspicious one. The next day was also a memorable one for the group as KP helped us identify another auspicious day to hang our prayer flags at one of the pass. KP was an excellent guide and Tandin our driver had great initiative and a fantastic entertainer. I’m just back home and already missing Bhutan. It is a very interesting and beautiful country and our stay there was great and we really liked everything, culture, people and food. The festivals we attended were very amusing and Taktsang Dzong is astonishing. Our guide, Kuenzang Dema, was very nice and kind even if with little experience, and she should improve much herself. We appreciated a lot the driver. Mr. Karma is highly careful and accurate, the car always clean and impeccable. Thank you for the well-organized journey.